Agra has been a major center of carpet production since the great period of Mughal art in the sixteenth and seventeenth centuries. When the carpet industry was revived there under British rule in the nineteenth century, the great Mughal tradition got a new lease on life, accompanied by a new interest in the sorts of classically derived designs current in Persian rug production during the same period. Because of this, nineteenth and early twentieth century Agra carpets enjoyed a varied and eclectic background that could draw on all the great achievements of Oriental carpet weaving. Antique Agra rugs present elegant allover designs alongside medallion or centralized patterns. 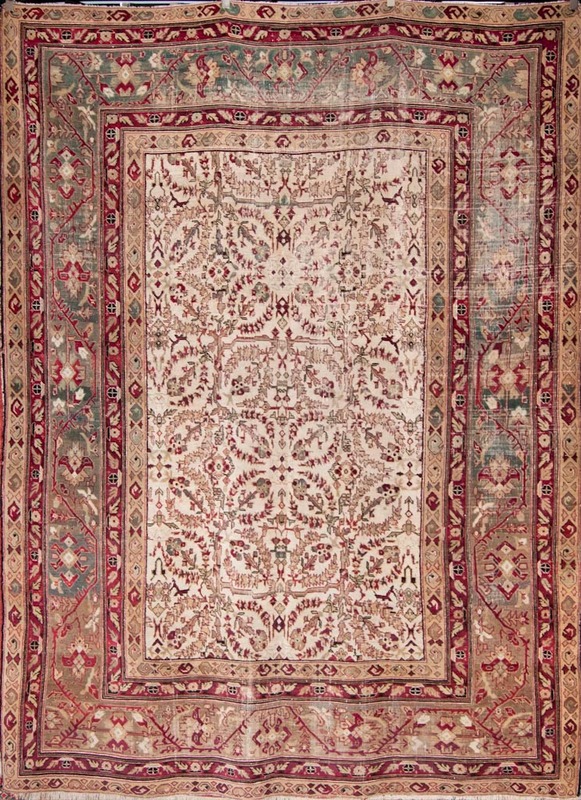 They have the rich pungent palette of classical Indian and Persian carpets as well as soft, cool earthy tones. Located in the Uttar Pradesh state in northern India, Agra is most widely recognized for the Taj Mahal, the Mughal Emperor Shah Jahan’s mausoleum for his third wife. Less widely known is that it has also been a large center for rug weaving since the 16th century. When Agra first became the Mughal capital in 1566, it too did it establish its presence as a rug weaving center. 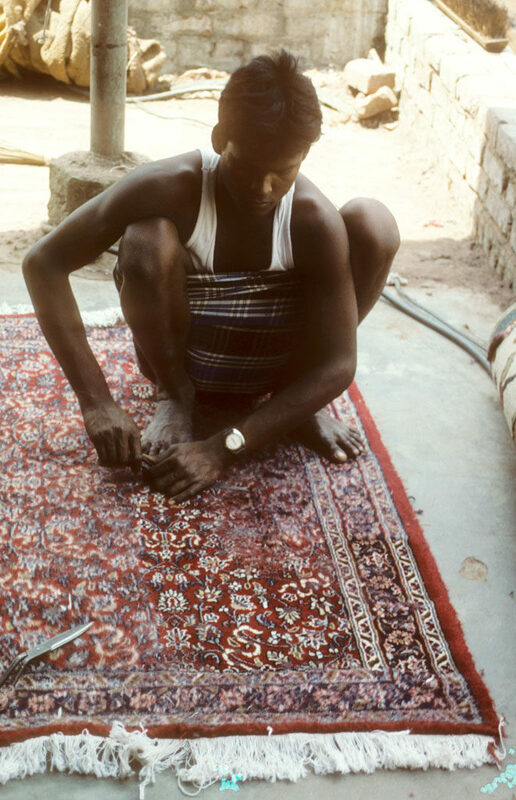 The Indians themselves had never had much need for large carpets and the craft was introduced relatively late. During the 17th century, a number of skillful Persians were called in to impart their weaving knowledge in India. 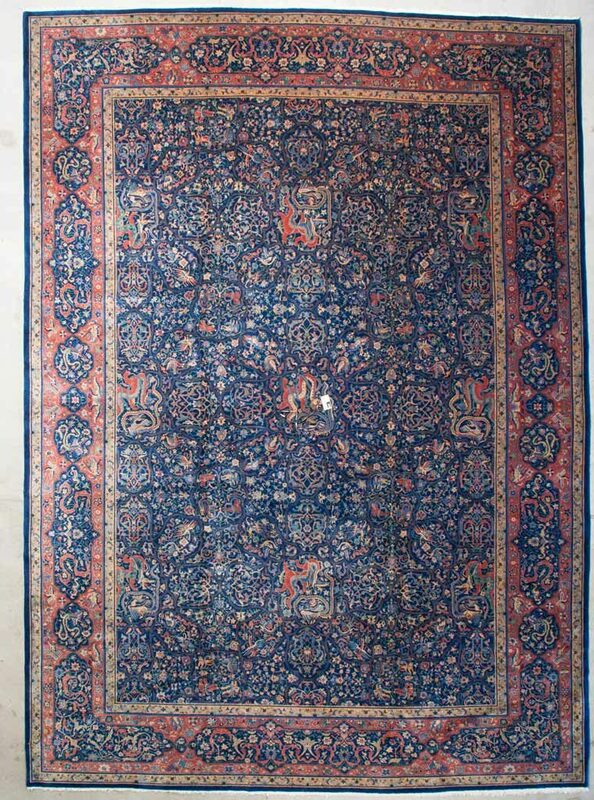 Large carpet factories were started in Lahore; the patterns as well as the knotting closely resembled Persian work. A number of antique carpets from this time are now found in museums throughout Europe and America. Production of fine rugs continued here through the decline of the Mughal Empire in the 17th century after which most antique Agra rugs were categorized as Indo-Isfahan weaving. Since the end of the 19th century rugs in India have been primarily woven to order and have been made with the finest quality in mind. Although later rugs do derive patterns from their predecessors, the changing style of Agra carpets can be most clearly seen during the British rule of the 19th and 20th centuries. Production ceased after the 1920’s but resumed again in more recent times. Now, Agra carpets are considered some of the most decorative pieces internationally. Agra Rugs are difficult to classify as they vary in size, design, and composition. Although they often exhibit open fields with smaller medallions and guards, they can also be woven with all-over designs. Similarly, the fields are usually composed of olive greens, blues, fawns, and tans, but can also be red or other colors. They are usually woven with wool, but can also be found with cotton. The older Mughal pieces are relatively rare (they are usually found in fragments or are re-sized and heavily restored) and as such are much more valuable. The weight of an Agra is one telling factor between Mughal Agras and the Agras from the 19th and 20th century; newer Agras are heavier. It is also difficult to tell Agras apart from other Indian rugs such as Amritsars. Many times dealers will label a piece as an Agra as the connotation is much better than Amritsar, but this is a misnomer. While the definite location of any one piece is hard to distinguish, one can be sure that real antique Agra carpets are fine pieces and great for collectors and designers alike.